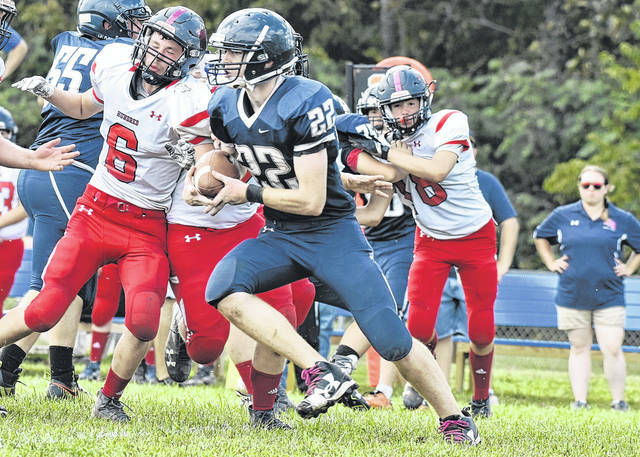 Hannan’s Jordan Fitzwater (22) carries the ball during the Wildcats contest against Hundred on Sep. 15 in Ashton, W.Va.
Last Game: Spring Valley defeated St. Albans 60-6, in Huntington; Point Pleasant defeated Man 49-0, in Man. SVHS offense last game: 433 rushing yards, 49 passing yards. PPHS offense last week: 216 rushing yards, 194 passing yards. SVHS offensive leaders last game: QB Will Adkins 2-of-3, 31 yards, 1TD, 1INT; RB Graeson Malashevich 3 carries, 169 yards, 2TDs; WR Graeson Malashevich 1 reception, 25 yards, TD. PPHS offensive leaders last week: QB Cason Paynen 18-of-22, 174 yards, 2TDs, 1INT; RB Brady Adkins 11 carries, 113 yards, 1TD; WR Brady Adkins 5 receptions, 63 yards, 1TD. SVHS defense last game: 38 rushing yards, 14 passing yards. PPHS defense last week: 107 rushing yards, 53 passing yards. 1. Both Point Pleasant and Spring Valley have made 10 straight playoff appearances. The Timberwolves have won postseason contests in back-to-back years, finishing as Class AAA runner-up each season. The Big Blacks have won at least one postseason game in five straight years. 2. Point Pleasant is back at OVB Track and Field for the first time since its Week 5 win over Pikeville. Spring Valley is coming off its bye week, and is on the road for the first time since Week 6. 3. The PPHS defense pitched a shut out for the second time this season a week ago. Point Pleasant last had two shut out wins in the same season in 2015, when it blanked Princeton in the regular season finale and Huntington in Week 2 of the postseason. The 2014 season was the last time the Big Blacks held multiple regular season opponents scoreless, doing so on four times. 4. Spring Valley’s only one-possession game of the season was a 21-13 win at Capital in Week 6. SVHS has 13 passing touchdowns, 33 rushing scores, and a pair of defensive touchdowns this season. PPHS has had a pair of one-score games, while picking up 38 touchdowns on the ground, 11 touchdowns through the air, one defensive score and one special teams touchdown. 5. Point Pleasant and Spring Valley are two of 11 undefeated teams in the state. The Timberwolves enter Week 10 at the top of the Class AAA rankings, with two other unbeaten teams in the class. The Big Blacks enter the week at sixth in Class AA, which has three other undefeated teams. Last Game: Wahama lost to South Gallia 42-20, in Mason; Trimble defeated Southern 51-0, in Racine. Last meeting between the teams: Sept. 30, 2016. Trimble won 46-0 in Glouster. Current head-to-head streak: Trimble has won 4 straight. WHS offense last game: 44 rushing yards, 143 passing yards. THS offense last week: 328 rushing yards, 82 passing yards. WHS offensive leaders last game: QB Abram Pauley 4-of-15, 143 yards, 1TD, 2INTs; RB Abram Pauley 7 carries, 18 yards, 1TD; WR Brady Bumgarner 2 receptions, 71 yards, 1TD. THS offensive leaders last week: QB Tabor Lackey 4-of-4, 67 yards, 1TD; RB Conner Wright 18 carries, 130 yards, 4TDs; WR Jack Nagucki 1 reception 34 yards. WHS defense last game: 349 rushing yards, 138 passing yards. THS defense last week: 30 rushing yards, 4 passing yards. 1. Wahama’s last victory over THS was on August 31, 2012 in Mason. The White Falcons defeated THS 25-12 en route to a perfect campaign and the Class A state title. The Tomcats blanked Wahama by a 46-0 count the last time these teams met in Glouster, on Sept. 30, 2016. Trimble holds a 7-4 record in the all-time series, which dates back to 1980. 2. Wahama is coming off a its bye week. The White Falcons are 11-4 after the bye in the last 15 seasons. Trimble is coming off of three straight shut outs. The Tomcats have blanked six teams this fall. 3. Trimble’s only loss of the season was a 21-20 setback to Cincinnati Hills Christian Academy in Week 5. Since then, the Tomcats have scored at least 42 points in every game. 4. In all-7 of the White Falcons’ losses, Wahama’s opponent has scored between 40-and-44 points. The White Falcons scored 20 points for the third time this fall in its last game. 5. The Tomcats have clinched a home playoff game and enter Week 10 at third in OHSAA Region 27. Wahama is 40th in the WVSSAC Class A rankings, tied with Montcalm. Last Week: Parkersburg Catholic lost to Williamstown 48-6, in Williamstown. Hannan lost to Buffalo 61-18, in Ashton. Last meeting between the teams: Sept. 10, 1999. Parkersburg Catholic won 43-0 in Parkersburg. Current head-to-head streak: Parkersburg Catholic has won 12 straight. 1. These teams met a dozen times between 1985 and 1999, with the Crusaders winning all-12. The last time PCHS visited Ashton was on Sept. 11, 1998 and resulted in a 55-0 road win. 2. Parkersburg Catholic is back in Mason County on the 11 years to the day since their last trip, when the Crusaders claimed a 50-30 victory at Wahama. 3. This is Hannan’s annual homecoming game and the Wildcats’ final home game of the season. HHS wraps up its campaign at Tolsia in Week 11. 4. The Crusaders are coming off their first setback of the season, after winning their first eight games by an average of 25.75 points. Hannan has lost their seven contests by an average of 37 points per game. 5. Hannan is the lone winless team in Class A and one of eight teams without a win in the state. Parkersburg Catholic is ninth in the Class A playoff rankings, one of five one-loss teams.